Have you ever attended a live auction by a professional auctioneer? Well this year is your chance to do so! We're hosting a live and silent auction with many valuable gifts that are worth your time. Our generous donors have been gracious enough to offer the exciting prizes below. If you are interested in donating as well, please contact us today. A trip for 4 to Mexico and a 4 night stay at a luxurious beach house. 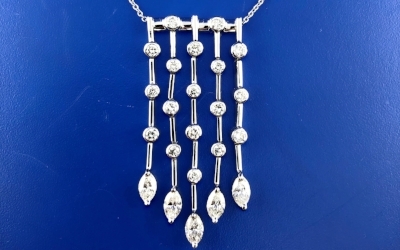 This elegant platinum pendant and chain with about 2.75 carats total weight in diamonds. Every year, the NAM convention organizes a raffle, and every year, lucky winners walk away with BIG prizes that makes their experience that much better. Check out our raffle prizes this year and be sure to buy your tickets today. Two round-trip tickets to Lebanon. $2500, $1000 and $500 in cash.